Information ALLCACA Portable Mini Photo Studio- Small size, powerful function! If you want to know more details or have any questions, please look through the detailed page or contact the customer service. 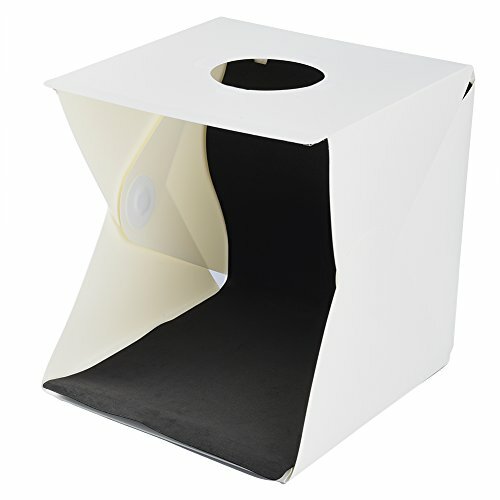 Features Material: plastic Size: 30x30x30cm/11.8 quot;x11.8 quot;x11.8 quot; Net weight: 9.5oz/268g Color: white Package list: 1x mini photo studio; 2x EVA Backgrounds (black and white); 1x USB cable; 1x storage bag Notice * The actual color may vary slightly from the online image due to monitor color settings. * Please allow slight measurement deviation for the data. The portable light box studio is designed for small photographers, artists and internet sellers; beginners can also take professional photos. Lightbox Studio can quickly and easily shoot small items such as jewelry, accessories, toys, watches, gadgets and other items. You can expand this LED Lightbox Studio, assemble your own photography studio in minutes and place it on any surface. Portable folding magnetic circuit structure design, convenient to carry and install, built-in led lights for providing average light and preventing the shadows and reflections in the photo. Includes, 1x studio (including built-in LED lights), 2x background pad (black and white) and 1x USB cable, 1x storage carrying bag. If you have any questions about this product by ALLCACA, contact us by completing and submitting the form below. If you are looking for a specif part number, please include it with your message.